School is only two weeks away, and Smarty is eagerly looking forward to finding out who her new classmates will be. She is in a small school, so she already knows about her teachers. It's also time to plan after school activities trying to balance structured activities and unstructured time. Our school operates in trimesters, not in quarters. T1 is going to be a busy trimester in terms of after school activities, because that's when our school produces a musical. Smarty already participated in three musicals in elementary school, and she is very excited that her new K-8 school is bringing the same company in for their musical production. It's going to be The Little Mermaid, and it's the last chance for Smarty to participate, since the next year the musical will be targeted to kids in grade 2-4. But it also means two rehearsals a week on Tuesday and Thursday right after school ends for middle schoolers. Smarty will also continue with her taekwondo practice. She is now doing it for 10 months and she was just invited to join an advanced group even though she is only a camo belt. Unfortunately, advanced group practice never happens at a good time, so we had to look at taekwondo schedule long and hard trying to decide when to fit it in. Eventually, Smarty decided to do two 90-minute taekwondo practices a week on the same days as her musical rehearsals, Tuesday and Thursday. She joked that she hates these days already. She will also continue with a shorter taekwondo practice on Sunday when we don't have other plans. Finally, Smarty really wants to continue to participate in math contests. She is going to take an Art of Problem Solving class to prepare for this year's MATHCOUNTS and AMC8 - this class is going to be on Mondays. On Fridays, we will have our Math Club in school. We have no idea what the situation will be with homework and project work this school year. Last year, Smarty had very little homework that needed to be done right away for the next day, but she had to stay on top of multiple projects for several subjects. 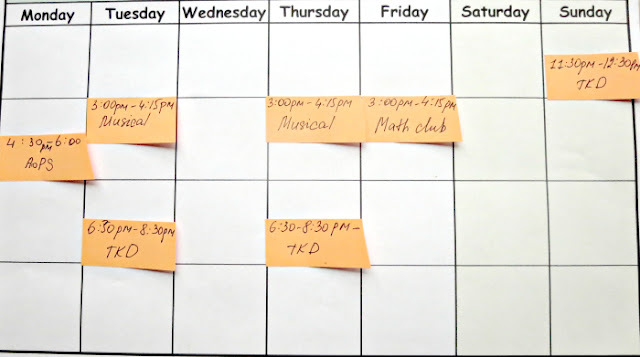 Her current plan assumes that she won't have a lot of time for homework on Tuesdays and Thursdays and that she can work on the projects and homework for her online class on weekends. She will also have one "activity-free" day on Wednesday which also happens to be an early release day. This day would be great for seeing friends and/or catching up on school work. We always try to keep our weekends free from commitments, so we can see friends, go places, and simply relax after our hectic weeks. Looking at the calendar, it looks like Smarty has a lot on her plate, but a lot of her classmates have even more challenging schedules with language classes, religious activities, music, sports, tutors, etc. 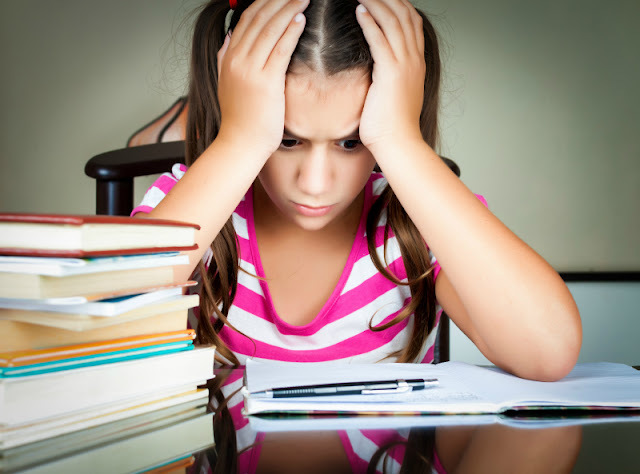 Personally, I think that having several enjoyable and diverse after school activities is better than spending extra time on electronic devices, but we are going to keep an eye on Smarty's mental and physical state as we always do, with the hope that she will rise to the challenge of balancing her responsibilities and her desire for free time. That schedule looks busy to me, but as you said, several have busier. If I'm honest, between the three kids our schedule probably looks a lot like that too.